Before I started my weight loss journey I was tired all the time. I wasn’t able to get out and run around with my kids because I was too winded. I had heartburn nearly every day, along with sleep apnea. My doctor finished explaining the results by telling me, “if you continue the way you are going, you will be dead by the time you’re 45”. I was only 27 years old. That night I went home and committed to changing my life… I had to. I was 5’10”, 270 pounds, and it was only going to get worse. I stopped smoking, stopped drinking and changed my diet. It wasn’t an easy transition, but it was one that I had to make in order to live the life that I wanted and needed to live. I had someone that I could go to for advice on nutrition and exercise. I was an athlete when I was younger, and knew some things about working out, but not as much as I wanted to know. The person I leaned on helped me get a diet plan down and helped me by keeping me accountable and motivating me to press toward my goals. After losing 105 pounds I am able to do things like chase the kids around, go hiking and rock climbing. My blood pressure, cholesterol, blood sugar levels, and liver are all perfect. I no longer have heartburn or sleep apnea. I have more energy than ever, and all because I made the changes that I needed to make. Losing the weight gave me back my life. I can do anything physically that I want to do without pain, fear, or embarrassment. 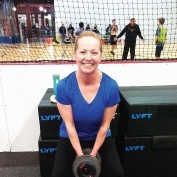 I became a personal trainer because I wanted to help other people get to the same place; a place of success, and joy. I wanted to be a part of people gaining back control of their lives and living the life that every human being deserves to live. I needed help, and had someone that had the ability to help me, now I get to be that help to others.